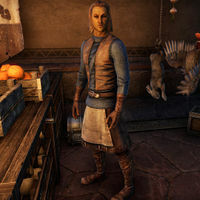 Angedreth is an Altmer grocer who runs Fine Foodstuffs in the Farmers and Laborers Hall of the Canton of St. Olms the Just in Vivec City. "Lord Vivec visited my shop just the other day. Charming fellow. Very polite. Even asked how I liked his fair city. But did he spend any gold? No, not even a few pieces for a hunk of bread or a block of cheese. I do hope you're better than that." "You'll have to excuse me. I'm still getting used to the fare they eat here in Vvardenfell. If there's something you want and I don't have it, that's probably because I thought it was nix-ox feed and sold it to a farmer." "If food were gold, then I'd be the richest merchant in Vivec City. But alas, all I have is food, food, and more food. Care to buy some food before it all spoils?" This page was last modified on 24 February 2019, at 00:17.